Normally it is best to use the BY HELPER Schedule View to edit, delete, clone, or assign shifts because it allows you to quickly make changes without the page reloading. To edit a shift on that view, you can click the shift, and use drag/drop to move shifts or Ctrl drag/drop to make a copy of a shift. Note: The By Helper view is also the only one that allows you to edit a shift's position. See By Helper Schedule View for more about using the By Helper view. If you are editing more than one shift, it may be more convenient to use the "Multi-Shift Edit" Schedule View. Change the times, display color, text, category, etc. 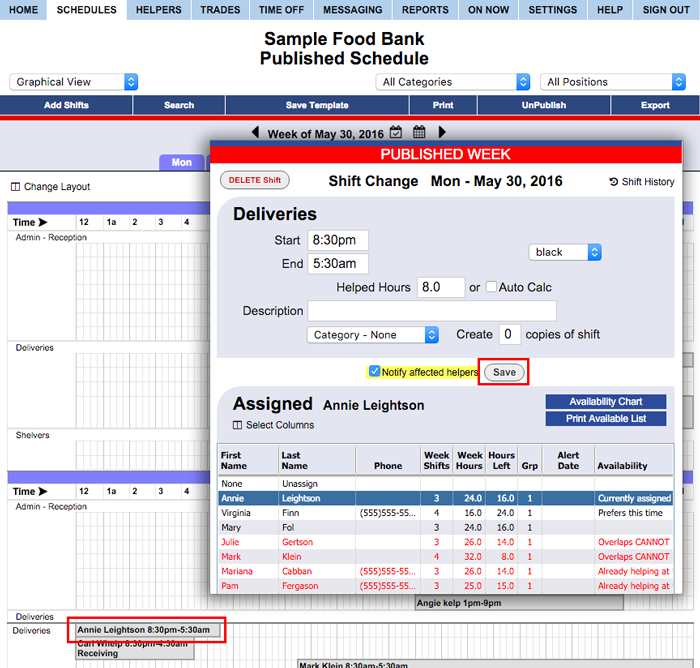 If the shift was on a published week, all affected helpers may be automatically notified.